Team ball sports such as soccer, basketball and volleyball have high participation levels worldwide. Musculoskeletal injuries are common in team ball sports and are associated with significant treatment costs, participation loss and long-term negative side effects. The results of recent randomized controlled trials provide support for the protective effect of injury-prevention exercise programmes (IPEPs) in team ball sports, but also highlight that achieving adequate compliance can be challenging. A key process in enhancing the ultimate impact of team ball sport IPEPs is identifying the specific implementation components that influence the adoption, execution and maintenance of these interventions. Despite this, no systematic review focussing on the specific implementation components of team ball sport IPEPs has been conducted. Our objective was to assess the reporting of specific implementation components in the published literature on team ball sport IPEPs using the Reach Efficacy Adoption Implementation Maintenance (RE-AIM) framework. Six electronic databases were systematically searched from inception to December 2012 for papers reporting team ball sport IPEP trials. All eligible papers were independently evaluated by two raters before reaching consensus on the reporting of individual RE-AIM items, using the RE-AIM Model Dimension Items Checklist (RE-AIM MDIC). A total of 60 papers, reporting 52 unique intervention trials, met eligibility criteria. Before consensus, the level of agreement across all trials between reviewers using the RE-AIM MDIC ranged from 81 to 91 %. The RE-AIM MDIC dimension of ‘efficacy’ had the highest level of reporting, with the five individual items in this dimension reported in 19–100 % of eligible trials (mean 58 %). The RE-AIM MDIC dimension ‘maintenance-setting level’ had the lowest level of reporting, with none of the four individual items in this dimension reported. For other dimensions, the mean level of reporting and range across items were ‘reach’ 34 % (12–60 %); ‘adoption-setting level’ 1 % (0–2 %); ‘adoption-delivery agent level’ 7 % (4–10 %); ‘implementation’ 36 % (13–63 %) and ‘maintenance individual level’ 1 % (0–4 %). Information on the specific implementation components of team ball sport IPEPs in published studies is scarce. In particular, major reporting gaps exist regarding the adoption and maintenance of these programmes. The RE-AIM MDIC can be successfully applied to reviewing literature in this context. The online version of this article (doi: 10.1007/s40279-014-0208-4) contains supplementary material, which is available to authorized users. JO’B was supported by a University of Ballarat Postgraduate Scholarship. CFF was supported by a National Health and Medical Research Council (NHMRC) Principal Research Fellowship (ID:565900 and APP1058737). This work was led by JO’B as part of his PhD studies, supervised by CFF. The Australian Centre for Research into Injury in Sport and its Prevention (ACRISP) is one of the International Research Centres for Prevention of Injury and Protection of Athlete Health supported by the International Olympic Committee (IOC). The authors have no conflicts of interest that are directly relevant to the content of this review. JO’B designed the study, led its conduct, performed the systematic search and had the major role in paper writing. CFF independently reviewed the eligible full-text papers, participated in the consensus discussions and contributed to the writing of the paper. Fédération Internationale de Football Association (FIFA). Big count. http://www.fifa.com/worldfootball/bigcount/. Accessed 12 Oct 2013. EuroSafe. Injuries in the European Union: summary of injury statistics for the years 2008–2010. http://ec.europa.eu/health/data_collection/docs/idb_report_2013_en.pdf. Accessed 10 Dec 2013. Virginia Polytechnic Institute and State University. What is RE-AIM? http://www.re-aim.org. Accessed 21 Aug 2013. Fogarty International Center. Frequently asked questions about implementation science. http://www.fic.nih.gov/News/Events/implementation-science/Pages/faqs.aspx. Accessed 20 Aug 2013. O’Brien J, Finch CF. 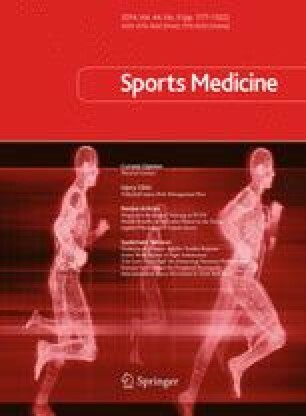 A systematic review of core implementation components in team ball sport injury prevention trials. Inj Prev. Published Online First 4 April 2014. doi: 10.1136/injuryprev-2013-041087. O’Brien J, Donaldson A, Barbery G, et al. The three must-do’s of intervention reporting: enhancing sports injury prevention research. Br J Sports Med. Published Online First 3 Sept 2013. doi: 10.1136/bjsports-2013-092913. Durlak J. The Importance of quality implementation for research, practice, and policy. http://aspe.hhs.gov/hsp/13/KeyIssuesforChildrenYouth/ImportanceofQuality/rb_QualityImp.pdf. Accessed 01 Jan 2013.